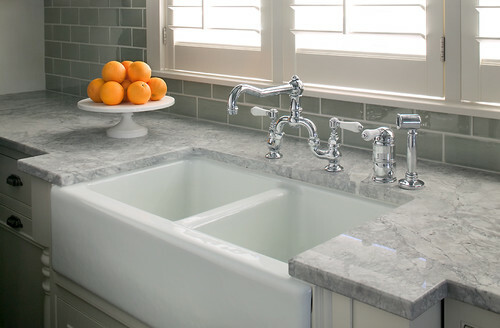 Super White is a fantastic alternative to white marble in a kitchen. 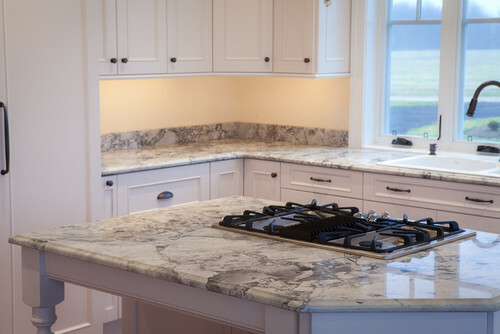 Today all five kitchens have Super White quartzite countertops. Traditional Kitchen design by Grand Rapids Architect Visbeen Associates, Inc.
We did this kitchen last year! Photo: MGS by Design. You can see more pics of this kitchen here. Wow ... there's a lot more black in Super White quartzite than I thought there was. Very interesting to see several different kitchens as it really shows the variations in the stone from slab to slab. Ya, it's funny, I had a customer recently asked me why it's called SUPER White when it's not really SUPER White, it's actually pretty grey.